Julian Hochberg was born on July 10th, 1923, in New York City. Like so many highly distinguished scientists he attended the College of the City of New York (City College), majoring in Physics. He was a graduate student at Berkeley in the latter days of Tolman and the time of Brunswik. On completion of his PhD, he took up his first academic appointment in 1949 as an Instructor at Cornell where he became Professor in 1960. He moved back to New York City in 1965 to become Professor at New York University. In 1969, he became Professor at Columbia University where he remained until his retirement. Julian Hochberg has been a leading experimentalist and theoretician in visual perception for half a century. 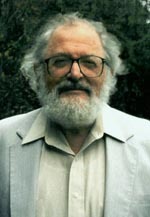 Among his many contributions, he has pioneered work on how we integrate the snapshot-views of the world with individual visual fixations into fully-formed percepts of the world “in the mind’s eye.” He has led our research and thinking on the Gestalt problem and how our percepts are structured to maximize both the likelihood of their being accurate and their simplicity. Beyond his explorations of form and motion perception, Hochberg extended his reach into the perception of pictures, film, and dance. Hochberg has received many honors, among them election to the National Academy of Sciences, the American Academy of Arts and Sciences, and the Society of Experimental Psychologists. He has received awards such as a Guggenheim Fellowship, the Warren Medal of the Society of Experimental Psychologists, and an Honorary Degree from Columbia University. He has also assumed many responsibilities, including Presidencies of the Eastern Psychological Association and two divisions of the American Psychological Association (Division 3: Experimental Psychology and Division 10: Psychology and the Arts), and Chair of Section J (Experimental Psychology) of the American Association for the Advancement of Science. He has also been appointed to National Academy of Sciences and National Research Council committees in sensory processes and human factors, and was twice the Chair of the Psychology Department at Columbia University. In addition he has also served on the boards of major journals including Psychological Review, American Journal of Psychology, Journal of Experimental Psychology: General, and Journal of Experimental Psychology: Human Perception and Performance. * The FABBS Foundation would like to thank Dr. Mary Peterson and Dr. James Pomerantz for nominating Dr. Hochberg for this honor and for leading the effort to spread the word about his nomination. Would you like to honor Dr. Hochberg? It’s not too late to have your name added to the list of donors! You can make your donation to Dr. Hochberg’s In Honor Of… campaign at anytime.